Three STS-49 crew members grab the INTELSAT VI on the third try during an EVA in May of 1992. 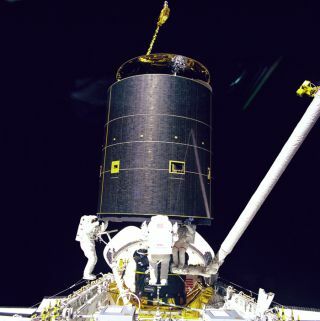 In this historical photo from the U.S. space agency, three crew members of mission STS-49 hold onto the 4.5 ton International Telecommunications Organization Satellite (INTELSAT) VI after a six-handed "capture" was made minutes earlier during the mission's third extravehicular activity (EVA). From left to right: Mission Specialists (MS) Richard J. Hieb, Thomas D. Akers, and Pierre J. Thuot. The three prepare to attach the capture bar which is tethered to Hieb. Thuot is positioned on the Remote Manipulator System (RMS) arm, from which he had made two earlier unsuccessful grapple attempts on two- person EVA sessions. Ground controllers and crewmembers agreed that a third attempt, using three mission specialists in the payload bay (PLB) was the effort needed to accomplish the capture feat. Behind the three astronauts is the vertical perigee stage which will be attached to the Intelsat VI prior to its release from the PLB.